While cooking in the kitchen, one of the most important tools is your knife. 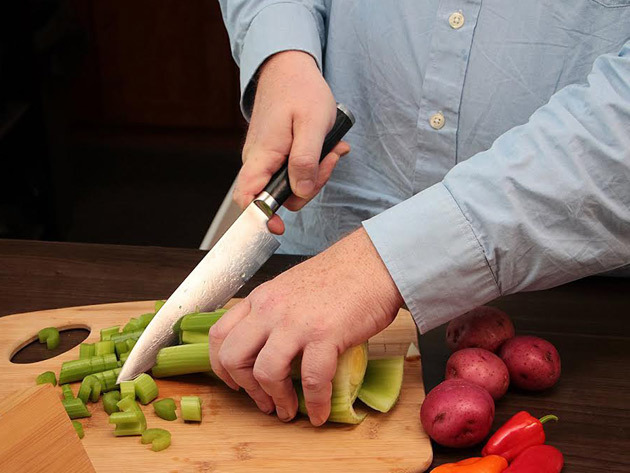 Having a sharp, durable knife means that you’ll be able to cut more easily with less risk of accidentally hurting yourself. That’s exactly why you need the Damasukasu 3-Piece Handmade Japanese Chef Knife Set where each knife takes more than 120 hours to complete by hand. Take pride in your kitchen cutlery and harness the power of the ancient Japanese Samurai with each cut. Manufactured from the same Damascus Steel used in Samurai swords, this gorgeous 3-piece set turns cooking into an art form. With each knife crafted from 67 unique layers of nickel-rich steel, this knife set stays sharp for a very long time. In fact, the first cut will be just as sharp as any cut made 100 years down the line. The Damasukasu 3-Piece Handmade Japanese Chef Knife Set includes 8”, 5.5”, and 3.5” knives. The 12 degrees cutting edge ensures that every slice is made with laser precision. The full tang blades are cooled in nitrogen to enhance hardness and durability. Get your Damasukasu 3-Piece Handmade Japanese Chef Knife Set today for just $49.99, which is 91% off the original price. Be sure to use code SEMIANNUAL for an additional 15% off, which brings the total down to just $42.49!